This is a major study in cross-cultural reception. Despite their religious and geographic differences, the British poet Lord Byron shared certain attitudes about politics, institutionalized religion, and individual identity that made him very popular with Jewish readers. In Byron and the Jews, author Sheila A. Spector investigates why, of all the British Romantic poets, Byron is the most frequently translated into Hebrew and Yiddish and how Jews used translations of Byron’s works to help construct a new Jewish identity. Spector begins by examining Byron’s interaction with contemporary Jewish writers Isaac D’Israeli and Isaac Nathan and investigates how the writers translated each other. The following three chapters demonstrate how the Byron translations interrelated with intellectual leaders of the three cultural movements that dominated Jewish culture in the nineteenth and twentieth centuries: the Maskilim, the Yiddishists, and the Zionists. Spector’s conclusion explores the theoretical inference implicit in this study—that the act of translation inevitably produces an allegorical reading of a text that may be contrary to an author’s original intention. A useful appendix contains transcriptions of many of the texts discussed in this volume, as few of these Hebrew and Yiddish translations are readily available elsewhere. Not only are portions of all of the translations represented, but different versions are included so that readers can see for themselves how Byron was adapted for different Jewish interpretive communities. Scholars of Byron, Jewish identity, and those interested in translation and reception studies will appreciate this insightful volume. Sheila A. Spector is an independent scholar who has devoted her career to exploring the intersection between Romanticism and Judaica. In addition to a two-volume study of Blake and Kabbalism—"Glorious Incomprehensible": The Development of Blake’s Kabbalistic Language and "Wonders Divine": The Development of Blake’s Kabbalistic Myth—she has edited three collections of essays on Romanticism and the Jews: British Romanticism and the Jews: History, Culture, Literature; The Jews and British Romanticism: Politics, Religion, Culture; and Romanticism/Judaica: A Convergence of Cultures. Byron and the Jews is an informed and informative seminal study, making it highly recommended for students of the life and works of Lord Byron, as well as a valued addition to the academic library of Judaic Studies and Literary Studies reference collections." I do not know of any other book on the subject or any other scholar who knows as much about these translations as Sheila Spector. Byron and the Jews will complement other books on British literature and Judaism." Byron and the Jews is a fundamental resource, which no doubt will be consulted by every scholar of translation and of reception in both Romantic and Jewish literature. Spector provides a near perfect balance of literary analysis within its social and historical contexts. The analysis of the different pieces is brief, yet poignantly accurate." 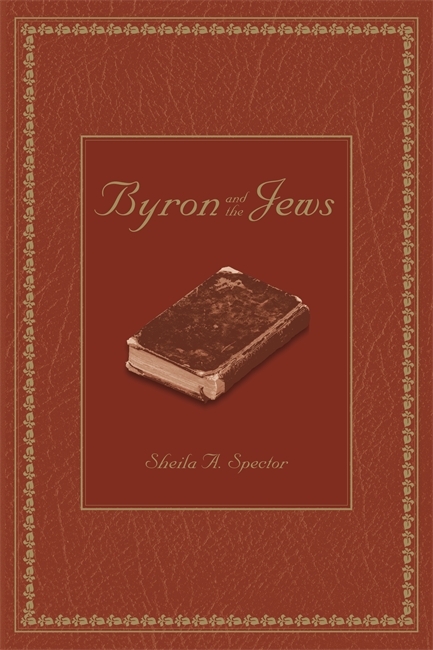 Sheila Spector's Byron and the Jews is a marvel of scholarship, deftly interweaving the treatment of Jewish themes, approaches to reading, translation theory, and the historical importance of Byron's work to the Jewish community-and vice versa. Ambitious and accomplished, Spector's book performs foundational as well as groundbreaking work in illuminating the works of Byron's Jewish translators. Translation is here revealed as both interpretation and deployment of Byron's words and themes in the cause of Zionism and the aesthetic theories of several generations of Jewish writers. Bravo to Sheila Spector for restoring the historical record and elucidating the complexities and fascinations of the Jewish response to Byron." Sheila Spector addresses the Jewish reception and translation of Byron, from Byron's collaboration with Isaac Nathan on the Hebrew Melodies to The Prisoner of Chillon and Darkness. Jewish translators responded to the Byronic hero as outlaw and exile, as in Byron's dramatization of Cain, or the role he assumed as narrative persona in Childe Harold's Pilgrimage. This is a major study in cross-cultural reception."